British timepiece maker Marloe Watch Company has debuted its first Swiss made timepiece - the Haskell. The watch takes its name from the Haskell Strait, which was the scene of great drama during Captain Robert Falcon Scott's first British Antarctica exploration, with Scott and his men struggling to get across disintegrating ice while dodging patrolling Orca. 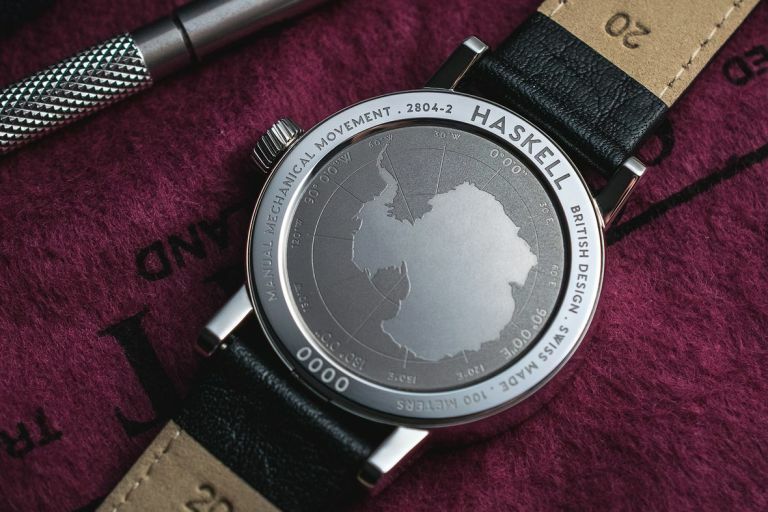 Naturally for a watch influenced by one of the world's most famous adventurers, the Haskell has been "designed with the modern day explorer in mind, whether an urban adventurer working through the bustling city commute, a world traveller hopping from airport to airport or a trekker facing a new terrain." It achieves this by partnering a large, clear dial with applied indexes, Arabic numerals, superluminova glow-in-the-dark blocks and matching finished bespoke hands, which combined make time reference exceptionally quick and easy. The Haskell measures in at 40mm in diameter and is 9.5mm thick, with a subtle barrel profile with robust lugs, flat sapphire crystal, and signature domed caseback delivering a distinctive, classic design. Each Haskell also comes engraved with a unique serial number and is presented in a waxed walnut box. The watch also boasts water resistance up to 100 metres in depth. The Haskell is available now for £995.00 and can be picked up in one of four distinct colourways: white, sand, blue and green. As ever, more information about Marloe's watches and its heritage can be found over the maker's official website.